Mill No. 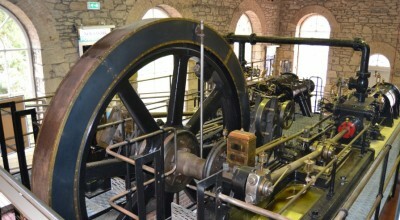 2 at New Lanark originally had a pitched roof like its neighbours but was altered by the Gourock Ropeworks in the 1880s as the company deepened the original mill with the brick extension seen today on the front and, having removed the roof to do so, left it flat for the laying out of nets and sails. A few years ago, New Lanark Trust saw the potential for a garden on the flat roof that wouldn’t impact on the historic village layout or be at odds with the surrounding wild landscape. It would be a modern garden that would enhance visitors’ experience, but tie together many of Owen’s visionary ideas, including his belief that to improve conditions for workers the environment was important, as were spaces for relaxation. The award-winning designer Douglas Coltart, of Viridarium, devised the garden. His brief required him to consider whether the design should reflect the surrounding classical architecture, or the circular nature of the waterwheel, the balancing of hard and soft landscaping and how to provide interest all year round. Above all, there had to be a symbolic reflection of Owen’s ideals of the importance of the environment. Among the curves and swirls representative of the turning of the watermill and the spinning of the yarn, a circular, two tone maze was included to represent the quest for enlightenment. At its heart, the UNESCO World Heritage emblem symbolises the importance of New Lanark’s outstanding universal cultural value. 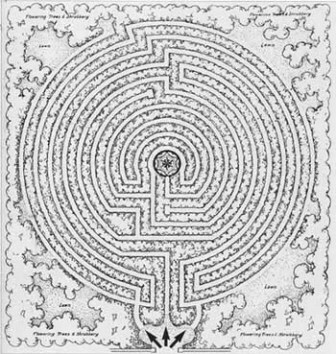 The maze is a feature with Utopian associations, representing a symbolic pilgrimage or quest for enlightenment or harmony. There was a full scale vine hedge maze in New Harmony, Indiana, USA when Robert Owen purchased the settlement when he left New Lanark in 1825, with the aim of establishing a “village of unity and cooperation” in the New World. It had been planted originally in 1814 by the Harmonist community under George Rapp when the settlement was founded. This was no ordinary maze, however. In each of their three towns (Harmony, Pennsylvania 1805-1815; Harmony, IN 1815-1825; and Economy, Pennsylvania 1825-1905) along with churches, homes, and businesses, the Harmonists built a labyrinth. The labyrinth was an important symbol for the Harmony Society as it represented, in physical form, the philosophy and beliefs that were the basis of their entire commune, anchored in the religious fervor of Adventists. "We endure and suffer, labor and toil, sow and reap, with and for each other." The inspiration for such aids to deep personal contemplation came from the labyrinths of holy sites such as Chartres Cathedral for, by mediaeval times, the ancient Cretan device for confining the Minotaur had gained greater intellectual and spiritual status, even likened to pilgrimage paths. While the single path or unicursal labyrinth retained its symbolisation of devotion, by the eighteenth century, branched or multicursal mazes had also become features of amusement and decoration with pagan influnces. This distinction has generally differentiated the meaning of the two terms ‘labyrinth’ and ‘maze’. The Harmonist labyrinth is not quite unicursal and does not exactly replicate the Chartres design. However, New Harmony also has a Chartres labyrinth. Under the patronage of Jane Blaffer Owen (married to Kenneth Owen, descendant of Robert Owen) until her death in 2010, programmes not only for restoration in the town but of art patronage had been developed for almost 50 years. One of the art projects was an exact copy of the Chartres labyrinth made in exquisite polished granite, following on-site survey by the artist in Chartres. The park in which it is located was made specifically for the labyrinth, imitating the dimensions of the nave of Chartres Cathedral. A fountain was added so that people could wash their feet before or after walking the labyrinth. The labyrinth has dedicated in 1998 by the Rector of Chartres Cathedral. 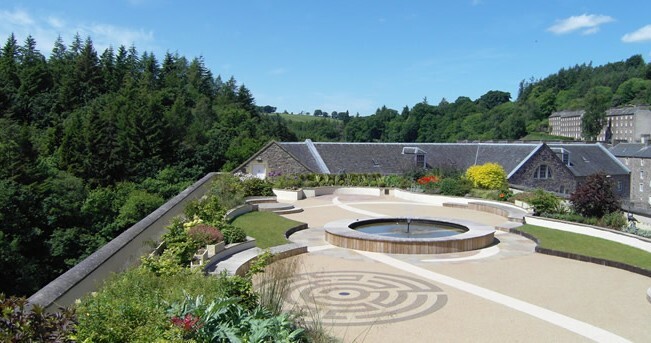 The New Lanark labyrinth, then, is a unicursal maze like the Chartres design but with only 5 rings unlike the 11 of Chartres and the 9 of the original Harmonist labyrinth of New Harmony. Largely for garden decoration, it nevertheless reflects one of the many threads of global cultural development with which Utopian Socialism is associated.